Nourishes and protects, rainproof in 2 hours. Nourishes and protects from scratches and scuffs, restores natural oils and prevents colour fading. It is rainproof in 2 hours and recoatable in 6 hours. Old decking: Use Ronseal Decking Cleaner and Reviver to remove any dust, grease, oil, mildew, algae and other contaminants. Remove any loose, flaking or peeling coatings. For best results and to avoid patchiness remove all previous coatings. Ensure the ends are adequately protected using Ronseal Decking End Grain Protector. New decking: The timber should be allowed to weather naturally (usually 6 months) to ensure any pre-treatment has sufficiently eroded to allow penetration and adhesion of the Oil. Clean the decking with Ronseal Decking Cleaner and Reviver, using a scrubbing brush to open the pores of the wood and remove any contamination from the manufacture of the decking. Then rinse thoroughly with clean water, ideally using a pressure washer and allow to dry completely before overcoating.Test effectiveness of cleaning by splashing the deck with water, if beading occurs, re-clean. Retest prior to applying Decking Oil. The shade label indicates approximate colour only. We recommend you test a small area to determine the final colour which may be influenced by the texture, grain, colour, porosity, type of wood and previous treatment. 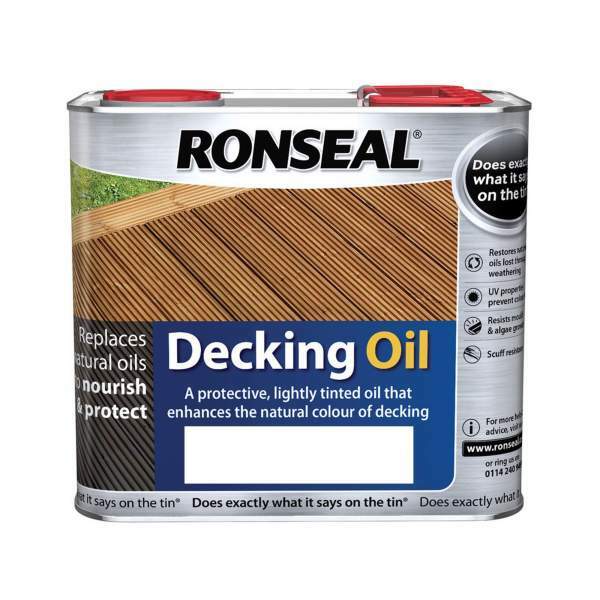 Please note that Ronseal Decking Oil cannot be used in conjuction with Ronseal Perfect Finish Decking Oil. Do not apply in wet conditions or if rain or frost is likely before the product is dry. Shake Ronseal Decking Oil thoroughly before pouring the entire contents into a suitable metal or plastic container. Stir before and during use. Do not dilute. If using more than one tin mix together prior to use. Apply a "flood" coat using a good quality brush or roller. Apply a second coat following the same method. Allow 6 hours between coats. Remove as much product as possible from application tools before cleaning. Clean brushes immediately with white spirit or paint brush cleaner. Do not empty into drains or watercourses. Some local authorities have special facilities for the disposal of waste coatings. 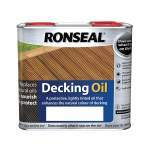 Decking treated with Ronseal Decking Oil can be cleaned using Ronseal Decking Cleaner and Reviver. Inspect the coating on a 6 monthly basis and re-coat when necessary.